Somerset House — named after Lord Protector Somerset, who built it in 1547-50, reminds us of the line of aristocratic palaces – such as York House noted earlier — that lined the Strand. Although the current building is not original, it gives an idea of the scale of the building and the grandness of the Strand itself. The original house, which has been used as a royal palace by the Queens of England, was demolished in the 1770s and the site allocated for government offices. Sir William Chambers rebuilt the present Somerset House as the first purpose-built office block. In the 19th century, it housed various government buildings including the Registrar General of Birth Deaths and Marriage ( founded 1837); the principle probate registry, the Admiralty, and the Poor Law Commission. There were learned societies there as well: the Royal Academy, Royal Society and Royal Society of Antiquaries. Until the Thames embankment was completed in the 1860s, the river used to lap up to the edge of the building, and it was possible to arrive by boat. For much of the 19th and 20th century it was mainly occupied by the Inland Revenue, but when that moved out in recent years it was given over to more cultural uses – the Courtauld Gallery, the Gilbert Collection of gold and jewellery and other cultural activities, including London Fashion Week. 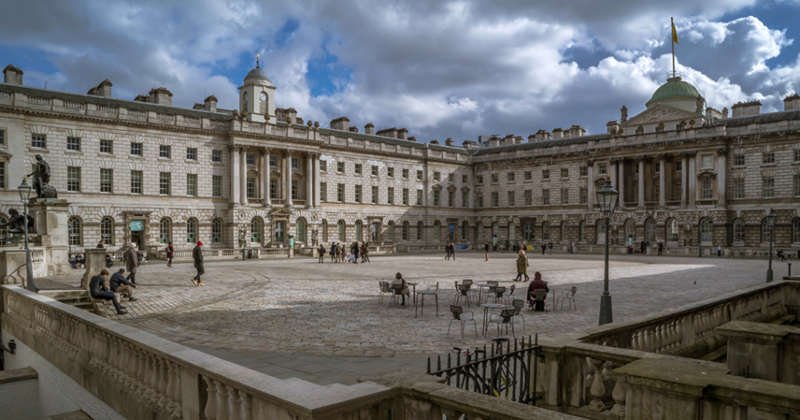 The aim for the present building, which is run by a separate trust, is to create a cultural and arts centre in Somerset House, part of which will include King’s College London, which occupies the East Wing and other buildings surrounding the courtyard and frontage.